A press conference was held yesterday at the Hyatt Regency hotel by race organizer Zazzle to announce the elite runners in the 101st Bay to Breakers race. Photos by Luke Thomas. Editor’s Note: With the war on fun continuing to erode San Francisco traditions, alcohol and floats continue to be banned from the Bay to Breakers race. According to race organizers, police checkpoints throughout the course will be deployed to ensure compliance. Additionally, runners must be registered. Runners without official race bibs, will be removed from the racecourse. For more info, visit zazzlebaytobreakers.com. This year, the Zazzle Bay to Breakers footrace welcomes back 2004 Olympic marathon silver medalist, Meb Keflezighi for the second time at the Cross City Race. Known simply as “Meb” to the running world, ZB2B follows his dominating win at the United States Marathon Olympic Trials. 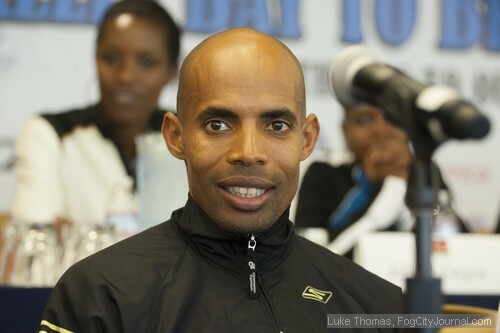 His Olympic Trials victory allowed Meb to make his third Olympic team and immediately catapulted him as a favorite to medal in the London Olympics this summer. Standing in the way of an epic victory for Meb in San Francisco is course record holder, Sammy Kitwara. The Kenyan, Kitwara is looking to capture his third title on the Great Highway and is one of the fastest men in world history over the half marathon distance. Not only does Kitwara hold the course record, he also owns a win in the narrowest margin of victory in ZB2B history. 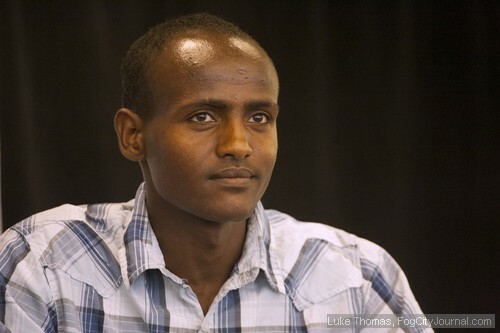 Looking for a victory of his own is Ethiopian, Direba Merga. Merga was runner-up at the centennial race and hoisted the victor’s laurels at the 2009 Boston Marathon. Merga is a well-known front runner who is unafraid to push the pace in a race and has declared the focus of his spring racing to win the 101st Bay to Breakers in San Francisco. This trio of men, along with athletes from Australia, Kenya, United States, and Ethiopia will vie not only for the champion’s trophy, but also for a $25,000 bonus if the winner can beat the top female to the finish line as well as $5,000 to be the first to crest the fabled Hayes Street Hill. The race kicks off at 7:00 a.m. at Howard and Beale Streets, when no more than 34 minutes later the fates of these men will be decided and the Bay to Breakers crown will be awarded. Registration for the 101st running of the Bay to Breakers is open online until Wednesday, May 16, 2012 on our website at the www.ZazzleBaytoBreakers.com. 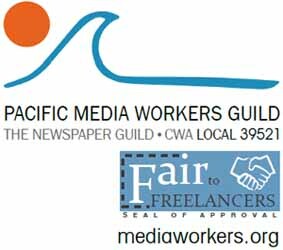 Registration will also be available onsite at Expo located at the Bill Graham Civic Auditorium at 99 Grove St. in San Francisco on Friday from 11:00 a.m. – 7:00 p.m. and Saturday from 9:00 a.m. – 6:00 p.m. Register and be a part of this iconic San Francisco race with these historic athletes. 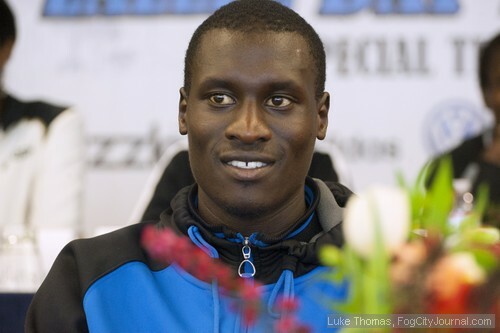 Highlights: Recently crowned Lilac Bloomsday champion in fast 38:26; Nudged out for the B2B win in 2011; course record at Frankfurt Marathon in 2011. 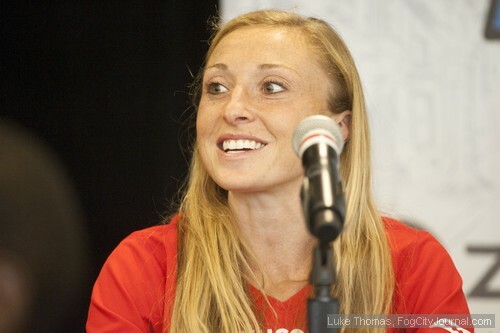 Highlights: Defended her Cherry Blossom title with fastest 10 mile time in the world. Highlights: Ran a blazing 32:19 10k at Crescent City Classic – known to be a fast starter. Lives in Mexico City and races throughout Mexico and South America. Highlights: Burundi Olympian in the marathon; collegiate career at University of Iowa; recently set a national record for 10000m at Stanford; National record holder in 7 events. Highlights: Has ran the most B2B’s of any elite women in field; impressive 2-min PR at Philly ½ Marathon in 2011; 3 time Carlsbad ½ Marathon Champ; Trains in Davis, CA. Highlights: Set personal best at ½ Marathon in early March and is looking to capture her first major title in road racing. 2012: 1st Napa 5k; 3rd Bay Area XC Challenge; 20th US National Championships XC Track Personal Bests: 5000m 16:40.05; 3000m steeplechase 10:11.95 Highlights: Former Cornell athlete who won the prestigious Penn Relays steeplechase and multiple time All-Ivy league performer in track and field and cross country. 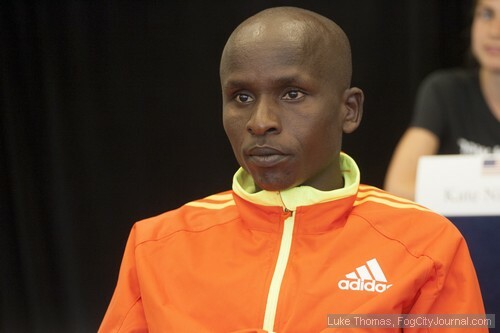 Highlights: Average 59:59 for top 10 of his fastest ½ Marathons; Average 27:46 for top 10 10k’s; Ran fastest ever 10k at Kenyan Championships (27:44.46) in 1,900m of altitude. 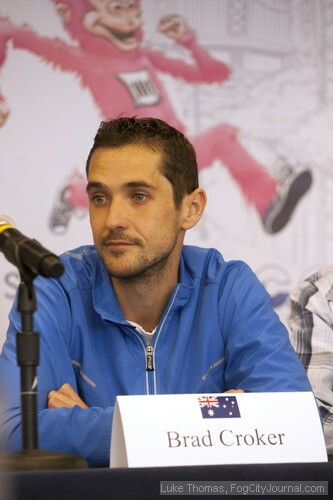 Ranked #1 at 12k and 20k, #2 at ½ Marathon in the world in 2009. Recent WR attempt at Rotterdam Marathon stopped short at 30k – but in tremendous shape. Highlights: 2004 Olympic silver medal marathon – first American male to win a marathon medal since 1976; Made 3rd Olympic team by winning US Trials in Marathon with a personal best; 2009 NYC Marathon Champ – first American male to win since 1982; 21 time US National Champion; former US record holder for 10000m (27:13); Olympic Trials record holder 10000m. The most consistent US performer in the last 10 years, Meb always brings his best at the big races. Highlights: On a great performance streak – won Bloomsday and set course record at Cherry Blossom with a personal best at 5k in Boston. Expect to be with leaders through the park. 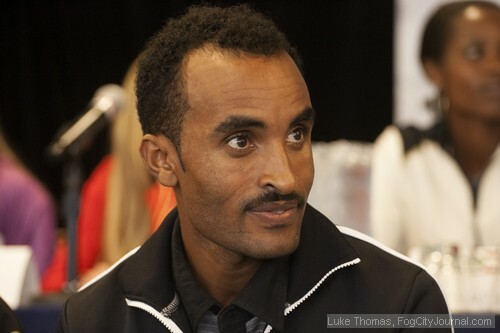 Highlights: 2009 Boston Marathon Champion; 4th in Beijing Olympic marathon; 6 marathons under 2:10:00; An exciting and bold front-runner, Merga’s reputation is to put all his chips on the table early in the race – expect Merga at the front near the top of Hayes St. Hill. Highlights: A consistent top 5 performer at major road races; lives and trains in Antioch, CA. Highlights: 3rd Place at the Nakuru 5000m in 2010 with 200 athletes in that single event at the track meet; lives and trains in Boulder, CO when racing in the United States. Highlights: Graduate of Syracuse; has set 3 personal bests on the track this year; major road race debut. Highlights: Former UCLA Bruin who led team to first NCAA cross country championships in 21 years, top American at Berlin marathon in 2010. Highlights: Runs for BAA, former Carnegie Mellon athlete, national class 3000m runner specializing in the indoor circuit. Highlights: Finished 10th at the 41st annual Sydney City to Surf – the Australian sister race of B2B designed and inspired by B2B. Highlights: Former Stanford runner, turned to marathon after college; experienced centipede racer. Highlights: A true racing veteran, Uli is also an accomplished ultra-distance runner. 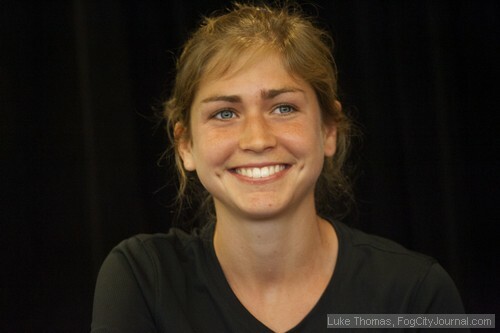 Former Portland Pilot and current coach at Seattle University; Portland Marathon course record holder; 2007 IAAF World Championship team in Marathon for Germany. 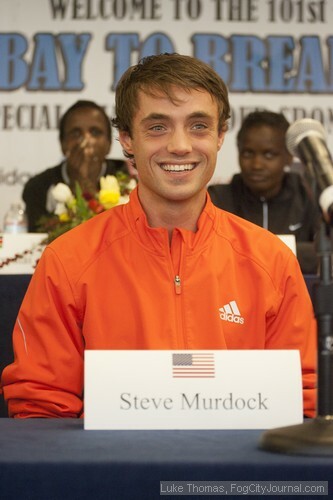 Highlights: Dual Citizenship with Great Britain- Represented GB at Austin Marathon. Highlights: A B2B lifer, has been running the event since a child growing up in Novato and embraces the spirit of the race year after year…runs in costume. – The course is a 12K footrace (7.46 miles) that starts at the San Francisco Bay (Howard and Beale Streets), crosses the city, and ends at the Pacific Ocean (the Great Highway). – 55,000 registered runners and walkers participated in 2011 and represented the serious and not-so-serious side of the sport, including world-class runners, costumed contenders, and weekend warriors. – The international scope of Bay to Breakers has attracted elite runners from countries throughout the world, including: Australia, Belgium, Brazil, Canada, China, Colombia, Eritrea, Ethiopia, Germany, Great Britain, Ireland, Japan, Kenya, Mexico, Morocco, Namibia, Poland, Portugal, Romania, Russia, South Africa, Tanzania, Ukraine, the United States, and Zimbabwe. – Bay to Breakers was ranked the 5th largest road race in the country and the 9th largest in the world in 2011. – Bay to Breakers is the 13th most-run road race in the world and 5th longest-consecutively run. -American Red Cross volunteers treat approximately 450 participants on race day. – Between 1,500 and 2,000 volunteers help out on race weekend. – From 1993-1996, the Examiner Bay to Breakers was the first official 12K National Championship by United States Track & Field (USAT&F). USAT&F is the governing body of U.S. running. In 1994, American runners were able to use their Bay to Breakers race times to meet the standard required for entry into the Olympic trials. 1912: The Bay to Breakers, originally called the Cross City Race, is created to lift the spirits of the people of San Francisco during the tedious reconstruction following the 1906 earthquake. The first race hosts 186 starters, but only 121 participants finish. Robert “Bobby” Vlught, a St. Mary’s College student and part-time newspaper copy-boy, is the first to cross the finish line, with a time of 44:10. He credits his good run to his mother’s cooking. (He went on to win again in 1913!). 1928: The race moves to the last Sunday in January. It has been held on a Sunday ever since. 1940: Barbara “Bobbie” Burke is the first woman to participate in the race. She signs up as “Bobby” at the urging of her boyfriend who wants her to join him in the run. Race organizers are surprised when “Bobby” turns out to be “Bobbie,” but they don’t turn her away because her boyfriend is two-time (soon to be three-time) champion Ed Preston. Bobbie and Ed later marry; their descendents still run the race today. 1940: The first costumed runner participates dressed as Captain Kidd. He finishes last. 1949: First year the race is held in May. It has been held in May ever since. 1950: The first African American, 19-year old Ellwyn Stribling, wins the race. His time is 42:57. 1963: The smallest Cross City race on record, with only 25 registered runners. 1964: The race is officially renamed the Bay to Breakers. 1966: The San Francisco Examiner assumes sponsorship of the race and begins developing it into what it is today: an event that draws participants and spectators from around the world. 1971: Women are officially allowed to run the Bay to Breakers. Neurosurgeon Dr. Frances K. Conley wins the women’s division with a time of 50:45. 1974: Maryetta Boitano, age 10, becomes the youngest winner in the history of the race. She also sets the fastest women’s finishing time at 43:22 and goes on to win the women’s division in 1975 and 1976. 16,000 runners and walkers enter the race. 1986: The Guinness Book of World Records officially recognizes the May 18, 1986 Examiner Bay to Breakers as the largest footrace in the world. More than 110,000 people participate. 1989: Qualified men’s and women’s centipedes officially compete among seeded runners. 1990: The Back of the Pack Club, made up of walkers and striders of all ages, emerges as a result of the latest fitness trend among Baby Boomers. 1990: The Reebok Aggies set the men’s centipede record with a time of 37:39. 1990: The Reebok Aggies set the women’s centipede record with a time of 47:36. 1992: A Sub-Seeded section is added for runners meeting the new time qualifications. (12K times: 45:00 for men and 55:00 for women.) Costume judging is held on the race course for the first time. 1993: The men’s course record and world record is set by Ismael Kirui (Kenya); 33:42. 1993-1996: Bay to Breakers is designated the first official 12K national championship by the United States of America Track & Field (USAT&F), the governing body of U.S. running, in support of the 1996 Olympic Games. 1994: American runners are able to use their Bay to Breakers finishing times to meet the standard required for entry into the Olympic trials. 1995: The Bay to Breakers appears on the internet. 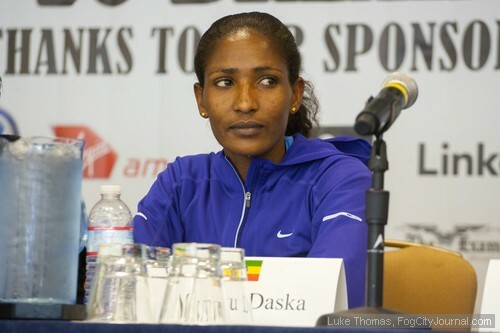 The women’s course record and world record is set by Delillah Asiago, Kenya; 38:23. 1996: The Tonight Show host Jay Leno serves as the Breakers Grand Marshal. 1998: For the first time in race history, more women register than men. 1998: The Examiner publishes the first 50,000 timed finishers’ names on the first official Bay to Breakers website www.baytobreakers.com. 1999: On-line registration makes its debut. 2001: 90th Anniversary of the Bay to Breakers. Organizers of the world’s largest footrace announce new, heightened emphasis on the event’s charitable mission: San Francisco Bay to Breakers Foundation, an organization dedicated to improving the lives of Bay Area children and youth, and assisting young people in crisis. 2005: With a finishing time of 38:22, Asmae Leghzaoui (Morocco) sets a new women’s world record and bests the course record, set by Delillah Asiago (Kenya) in 1995, by one second. 2006: Race organizers institute an equalizer, starting the elite women athletes ahead of the men, based on the average difference between each division’s course records. 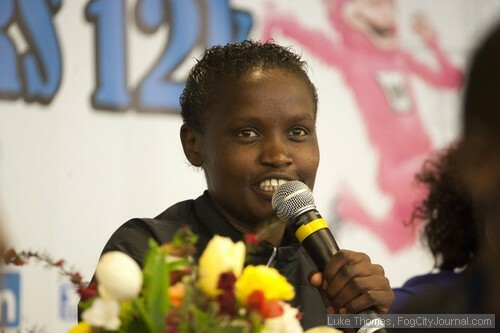 2007: As a result of the equalizer started the year before, Edna Kiplagat becomes the first female elite in Breakers history to cross the finish line ahead of the men. 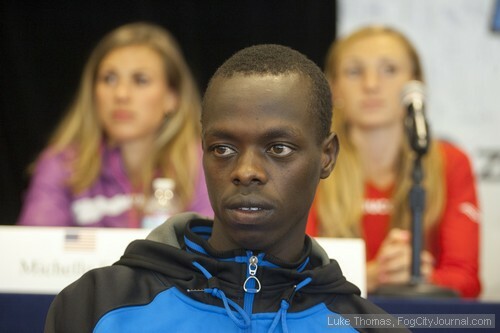 2009: Sammy Kitwara (Kenya) sets a course record and ties the 12K world’s best with a time of 33:31. 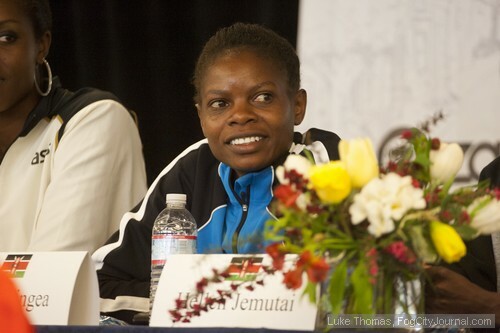 2010: Lineth Chepkurui (Kenya) sets new women’s course record with a time of 38:07. 2011: The historic 100th race: May 15th. The men’s LinkedIn Centipede sets a record breaking time of 37:00. The first Moroccan ever win’s Bay to Breakers. Comments for On Your Marks! Acclaimed Trio Face-off for Glory in 101st Bay to Breakers are now closed.